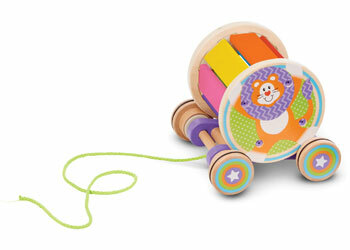 Take music-making on the move with this round rainbow xylophone pull toy that rings as it spins on a sturdy wheeled base! Kids 18 months and older will love discovering the bright colours, patterns, and musical sounds made by the removable chunky wooden ball. First Play toys feature bright colours, bold patterns, and whimsical designs that boost skills while sparking imagination and wonderright from the start!